Mount Frissell, 2,454 feet (748 m), located on the border of southwest Massachusetts and northwest Connecticut, is a prominent peak of the Taconic Range. 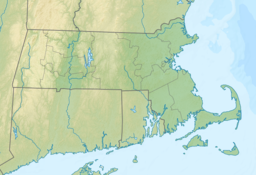 The peak and northern part of the mountain are located within Massachusetts, while the southern slope of Mount Frissell is located within Connecticut and rises to the highest elevation within that state, 2,379 feet (725 m). The high-point marker for Connecticut is on the border with Massachusetts at 42°02′59″N 73°28′59″W﻿ / ﻿42.049633°N 73.483042°W﻿ / 42.049633; -73.483042. Bear Mountain, located 1.3 miles (2.1 km) to the east, is the highest mountain summit in Connecticut. Most hikers reach the state high point by a rather short route starting high up in the col between Mt. Frissell and Bear Mountain, at an elevation of around 1,800 feet (550 m). The mountain is located within the towns of Mount Washington, Massachusetts and Salisbury, Connecticut; much of it has been conserved as part of Massachusetts' Mount Washington State Forest and Connecticut's Mount Riga Forest Preserve. The south side of Mount Frissell drains into Riga Lake and South Pond, then into Wachocostinook Brook, Salmon Creek, the Housatonic River, and Long Island Sound. The northwest side drains into Ashley Hill Brook, thence Bash Bish Brook, the Roeliff Jansen Kill, the Hudson River, and Upper New York Bay. The northeast side drains into Sages Ravine, thence into Schenob Brook, the Hubbard Brook, the Housatonic River, and Long Island Sound. Mount Frissell is bordered by Round Mountain to the southeast, Mount Ashley to the north, and Brace Mountain to the west. Mount Frissell is traversed by the Mount Frissell Trail which connects with the South Taconic Trail to the west and the Appalachian Trail to the east. ^ a b "Ryant Bush". NGS data sheet. U.S. National Geodetic Survey. Retrieved 2008-11-28. ^ "Mount Frissell, Massachusetts". Peakbagger.com. Retrieved 2008-11-28. ^ "Mount Frissell - South Slope, Connecticut/Massachusetts". 2015. Retrieved 2015-06-22. "Mount Frissell". Americasroof.com. Archived from the original on 2008-06-04. Retrieved 2008-11-28. Charles W. G. Smith, ed. (2004). Massachusetts Trail Guide. AMC Hiking Guide Series. Appalachian Mountain Club. ISBN 1-929173-44-X. "Mount Frissell". Geographic Names Information System. United States Geological Survey. Retrieved 2008-11-28.